Good drainage! The most important rule before planting your bulbs: Find a spot in your garden where water does not collect and drains away. Sunlight. Especially bulbs planted in perennial gardens. You can plant in part sun but remember the sun is the energy source required to produce flowers for future springs. 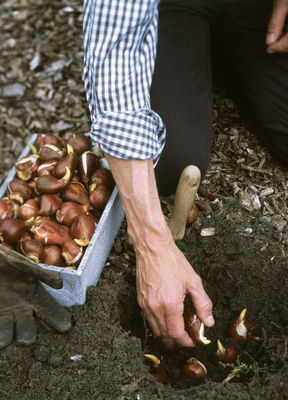 It is estimated that more than 10% of all bulbs purchased are NEVER planted! People just forget about them... So my first advice is to just stick them in the ground whenever you have time! Bulbs are very easy to grow. For the best results, plant spring-flowering bulbs like tulips, daffodils and crocus etc., in the fall. The general rule is not to plant bulbs before the soil temperature drops below 55 degrees. This is usually around the first night frost. If you find bulbs in March, always give it a try and plant them ASAP. Bulbs are not like seeds and can't be stored for the next season. Bulbs can be planted individually or in groups. I prefer planting in groups, because this creates the most dramatic display and it goes way faster than planting individually! The best planting depth for tulips is 6-8" deep. Some gardeners plant them even deeper, which can have a positive effect for perennializing. Check specific planting instructions for the proper depth and spacing for other bulbs like daffodils, muscari, etc. Smaller bulbs are planted less deep. Bulbs can be planted with very little or no spacing for the most dramatic display. However, if perennializing is desired we recommend to plant bulbs with about 4-6" spacing. If the soil at the bottom of your planting hole is loose and not compact, the roots will have an easier time developing. When planting your bulbs, plant them with the point straight up or sideways but not upside down. If the soil is dry at planting time, water thoroughly after planting. Rain should take care of watering needs during the winter and early spring. If the spring is extremely dry, water them moderately. Bulbs are not heavy feeders. We do not recommend adding fertilizer to the planting hole. Our growing methods are focused on healthy soil and fertilizing is not always the best choice to create healthy soil. Synthetic fertilizers throw the soil life out of balance and can burn the new tender roots. Instead, we recommend adding a handful of compost to feed your soil. Healthy soil will create healthy plants! For perennial bulb gardens, you could use an organic low nitrogen fertilizer in very early spring, when the shoots just push through the soil. 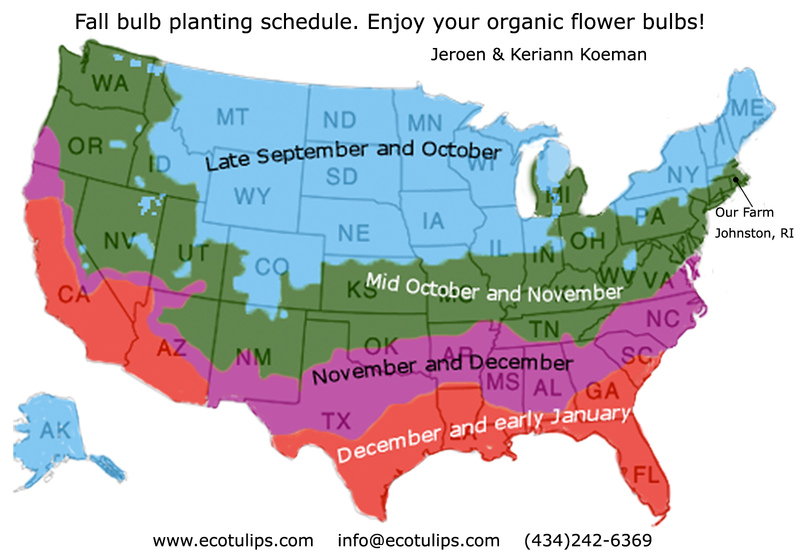 For more information, visit wickedtulips.com and ecotulips.com.